Have games of chance with the Devil ever worked out well? 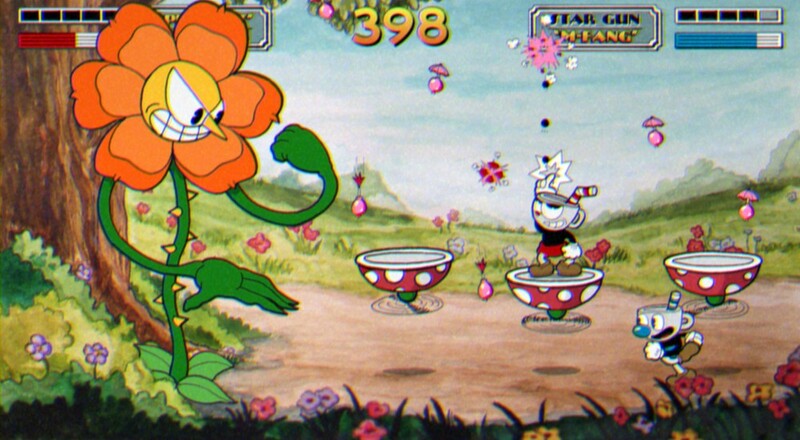 We caught a glimpse of it at last year's E3, but we finally got an extended look at the 1930's style platform shooter, Cuphead, at Microsoft's press conference. The video game lovechild of brothers Chad and Jared Moldenhauer follows the exploits of Cuphead and Mugman, a duo tricked into doing the Devil's bidding after a dice game gone awry. Seriously, though, who takes bets from Beelzebub anymore? You'd think at this point our concave-headed heroes would have laughed The Hellbeast out of the room once he made his offer. I suppose having liquid receptacles for heads may affect their decision-making skills slightly, though. The game features two player local co-op and will be headed to both Xbox One and PC sometime next year. Check out the E3 trailer below. Cuphead looks like an absolute blast and is part of Microsoft's initiative to flood their library with as many innovative indie games as humanly possible. Given the relative dearth of couch co-op offerings available on the Xbox One (but not PC, oddly enough), I'm sure co-op enthusiasts the world round will be pleased to have as many options as possible, especially if they're as unique as this. Page created in 0.7112 seconds.